The majority of handheld computers and smartphones doesn't have a QWERTY-keyboard. Should the device be equipped with a keyboard, it's said to have a thumb board. The only exceptions here are Nokia communicators of 9000 series. Usually a user should be satisfied with the digital keyboard or at best with the touch screen keyboard. In any case the input speed is noticeably slower than with the full size keyboard. Plug the keyboard via a synchronization connector. Minuses: keyboards are incompatible with the devices by other manufacturers; many models have no such a keyboard. Plug the standard USB-keyboard. The major plus: great variety of USB-keyboards that are cheap enough. Minuses: few devices with the USB-host; the cable is involved. Infrared keyboards. Pluses: an average price, good compatibility with different models. Minuses: devices should be within the direct visibility; the problem here is that different PDAs have IrDA located sometimes at unexpected places. Bluetooth-keyboards. The most promising and universal way of connection. Almost all modern PDAs and smartphones (with little exception) are equipped with a Bluetooth adapter. The connection doesn't need the devices to be within the direct visibility, as the process is wireless. No drivers are needed (in theory with the duplex support of HID profile). Minuses: such keyboards are expensive (about $100); there are problems with software. The review of today deals with one of such keyboards - it's HP iPaq Bluetooth Keyboard. 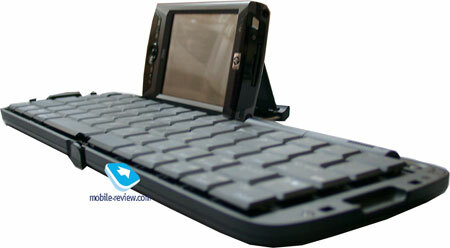 At the same time the makers of PDAs and smartphones announced the release of its keyboards (Dell, HP, Nokia). 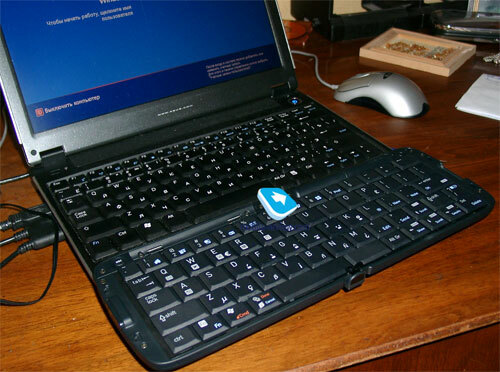 The keyboard by Dell and Nokia is the Think Outside Stowaway Wireless Keyboard released under another brand. HP iPaq Bluetooth Keyboard was developed by Darfon (the model G900). As there wouldn't be official shipments of the HP keyboard to Europe, the device will appear under different names depending on the local distributor. For example, the keyboard will come to Russia under the name Highscreen. The major exterior difference from the Stowaway keyboard is that the HP keyboard (let's call the HP iPaq Bluetooth Keyboard this way in our review) has an extra row of digital keys. Inside the HP keyboard there is an old chip applied, CSR BlueCore 2 (no support of HID profile; Bluetooth 1.1), while the Stowaway version involves new chip by Broadcom BCM 2040 (the support of HID profile; Bluetooth 1.2). Following the Bluetooth ideology, you don't need to install special drivers for each operating system, they are replaced by a higher level software - so-called profiles to receive high compatibility. The connection of the HP keyboard involves HID profile (Human Interface Device). The problem here is as follows, currently none of handheld computers or smartphones support this profile, so you cannot omit the driver installation, irrespective of the fact whether the keyboard supports HID profile. To tell the truth, the desktop PC has gained the support of HID profile quite recently. Well, because of it the compatibility opportunities of the HP keyboard get poorer, it can be plugged only to Pocket PC devices. No doubt, it's just a question of time and the popularity of Bluetooth-keyboards. When folded up the HP keyboard has the same size as a big widescreen handheld. It fits the hand and the pocket, but it cannot be called a small one (145x98x19.5 mm) or a lightweight one (175 g). However it's easy to transfer (especially in a case or a bag). The shell is made of black high-quality plastic. 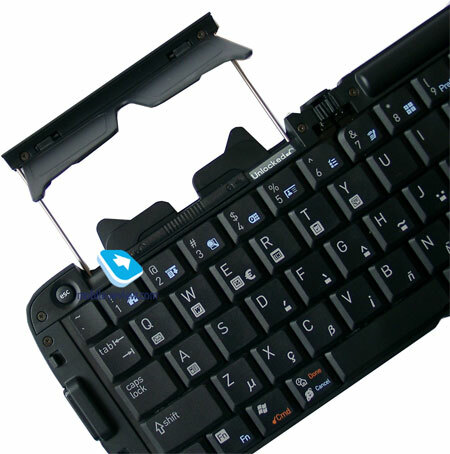 When you fold the keyboard up, a latch goes in. There can be no doubt, it locks for sure. When unfolded the HP keyboard measures 285x98x14.5 mm. Taking into account the size, it's the same as of my notebook. Surprisingly, but my perception of the text input on the notebook and on the HP keyboard was the same (the size and the keystrokes). The text on the PDA screen is displayed instantly, you hardly notice a delay. Unless there might be the upper row of functional keys (F1-F12 and some other), however that's not that crucial compared with the lack of the digital keys row in the Stowaway keyboard. After the keyboard is unfolded, you can lock it at the bend point. Thus the keyboard wouldn't fold up spontaneously placed on uneven of soft surfaces during the travel usage. Another nuance with the construction -you can pull out a PDA stand from the keyboard. At once you notice that the stand is meant only for the PDA with the portrait screen orientation, however the Windows Mobile 2003 SE already supports the landscape mode. To be more exact, you may put your PDA horizontally on the stand, but it will embarrass pressing keys from the top row. The keyboard layout is standard. The combination Fn+key enables a quick launch of specific Pocket PC applications. You can assign any other programs via the control utility. You can display on Pocket PC the battery charging level of the keyboard. The user can ask a right question - "how will the support of Russian language be implemented"? We answer. Firstly, the Russian letters of the ЙЦУКЕН (QWERTY) layout will be inscribed at the plant. Secondly, the standard kit will include the russificator LEng, which supports HP iPaq Bluetooth Keyboard (however this involve HP iPaq users only, and the russificator by Quarta supplied with iPaqs doesn't support the text input from this keyboard in Russian). 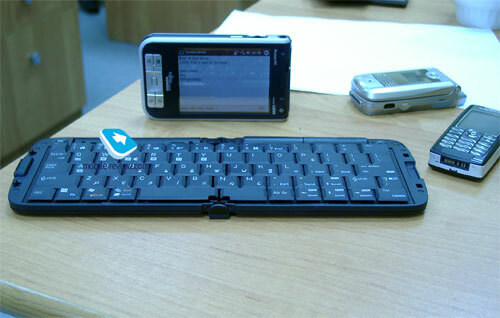 This keyboard will be compatible not only with iPaq handhelds, but with other Pocket PCs as well. We tested it with FS Pocket LOOX 720 and Asus A730 and had no complaints. In the settings you can put the key repeat rate and the rate of delay until repeat. 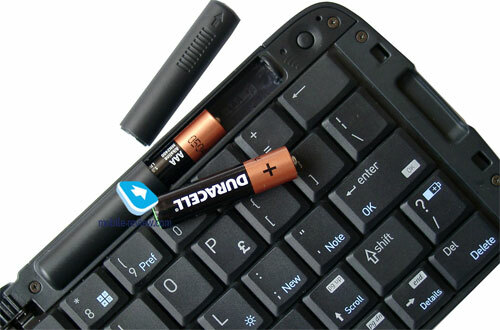 Two AAA batteries feed the keyboard. According to the manufacturer they provide 1000 hours (40 days) in the standby mode and 60 hours of continuous printing (some three weeks using the keyboard 2-3 hours a day). It turned hardly possible to check the time claimed in practice, but the real battery life seems to be true. After 1.5 week of active usage the batteries weren't drained out at all. The shipments of the keyboard are to start these weeks, in Russia it will cost about $95-100. However there is the potential for the price cut to $60-70. The keyboard made a good impression on me. It's not a small one, but its ergonomics is well thought-out and provide comfort use. The battery life is also very impressive. The keyboard has a major shortcoming; it doesn't support HID profile (you cannot connect the keyboard to the desktop PC). 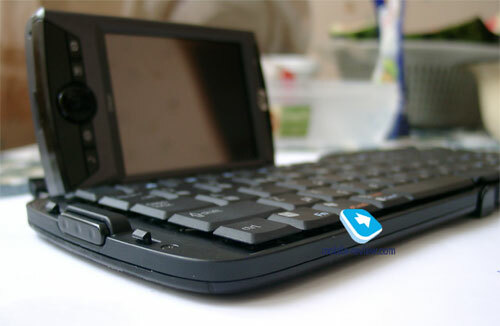 The iPaq Bluetooth keyboard will attract attention of Pocket PC users, who want to enter texts as easy as on a notebook (size and ergonomics of the keys, numerical row, long battery life).